Colorectal cancer is the second leading cause of cancer deaths in the United States—and with appropriate screening, it doesn’t have to be. 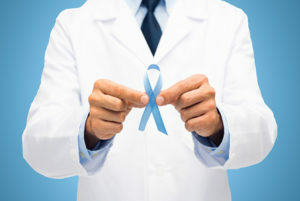 According to the CDC, regular screening can prevent six out of ten colorectal cancer deaths. Both women and men are at risk for colorectal cancer, and that risk increases with age, so screening is recommended for adults over 50. Other persons who may have increased risk include those with diabetes and insulin resistance as well as persons who have had radiation therapy directed at the abdomen to treat previous cancers. As always seems to be the case, there are some lifestyle choices a person can make to reduce his or her risk of getting colorectal cancer and which play a role in helping to improve outcomes. Exercise. If you are not physically active, you are more likely to develop colon cancer. Obesity. Being overweight increases the risk of colon cancer and of dying from the disease, and while obesity increases the risk for both genders, the link seems to be stronger in men. Smoking. People who smoke are more likely than nonsmokers to die from colon cancer. Alcohol. Heavy use of alcohol may increase your risk of colon cancer. Alternatively, limited use (no more than two drinks a day for men, one for women) may have some health benefits, including a lower risk of colon cancer. Diet. Diets high in processed foods and red meats can raise your cancer risk. The current thinking is that supplemental fiber is not the panacea it was once thought to be, but a diet high in fiber from natural sources like vegetables, fruit, and whole grains has been linked to lower risk. Still, fiber plays an important role in managing or preventing other health issues—like diabetes and obesity—that impact colon health. Treatments for colon cancer vary and depend on stage, location, and a patient’s overall health. More information can be found from The Colorectal Cancer Alliance.